It began as I started to introduce a new short story to my class of 8th grade students. I, as I always did, began to introduce the author- Guy de Maupassant. After a brief conversation about his life and the time period in which he wrote, I pulled out the trusty PowerPoint to build background on the time period within which the story, “The Necklace,” was set. We glanced over the hierarchy of wealth and a woman’s position at that time- or rather that her position depended solely on the position her husband held in society. Just as I finished this beautiful presentation, a motivated student raised her hand. She asked, “Mrs. Taylor, is the vocabulary worksheet due tomorrow?” I glanced down at the podium in front of me to see the perfectly stacked vocabulary worksheet resting upon it. And there it was… the predictability of my lesson was the proverbial smack in the face. 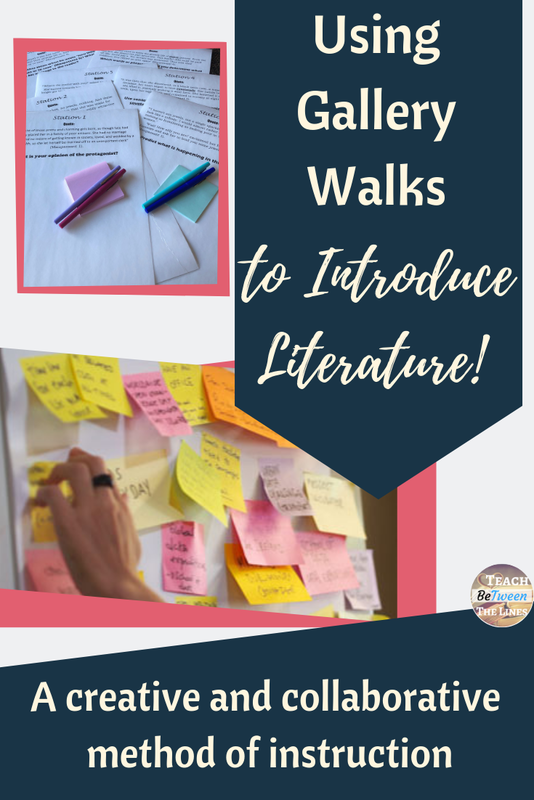 So, I set off on my search for new and innovative ways to introduce literature to my students. I, desperately, needed an idea that would get my kids up and moving, talking and collaborating, and, most importantly, one that would spark interest in the text itself. Then, I found- The Gallery Walk. A gallery walk sets up a learning experience for students that allows them to move through the material much like they would in an art gallery. The material is displayed on the walls for students to look at, interact with, and collaborate on the material presented in the gallery. There are so many uses for a gallery walk in an educational setting. This can be used within a variety of lessons or applications, but I love it especially for introducing a new text because it gives students a chance to interact with the text before actually reading the story. They will be able to build background, and maybe more importantly, interest with the story they will read. I set my students off on this gallery walk with a stack of post-it notes and some peers to collaborate with as they work to make meaning from passages I select from a given text. - Predict what is happening in this particular section of the text, or predict what might happen next in the text. - State their opinion of the protagonist based on a revealing passage of text. - Predict the author’s message based on a relevant section of text. - Find connections between a previous text. - Describe what a particular passage reveals about the time period within which the story was set. I also use gallery walks as an opportunity to build vocabulary within context. I will display a few sentences from the text and ask students to infer the meaning of the new underlined word. This activity allows students to practice context clues while providing that all important collaborative discussion opportunities. Students can make meaning of these new vocabulary words in a more interesting way than that boring vocabulary worksheet I so predictably assigned. Want to grab one of the units discussed today to print and use with your students? Click below to learn more about each of these introduction units. Subscribe to receive great ELA content and freebies right in your inbox.